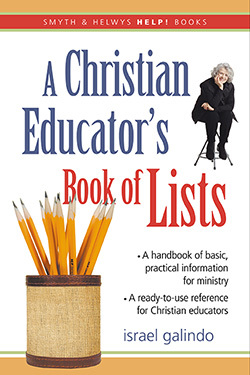 A Christian Educator’s Book of Lists is a manual of basic information that every Christian educator and teacher should have on hand. At the heart of this book is the desire to make available to churches and their leaders a handbook of basic, practical information for effective Christian education. Part basic encyclopedia, part trivia resource, part practical “how to” compilations, part teaching manual, and part general knowledge index, the book is a handy reference manual for Christian educators and teachers. It’s everything you need to know about Christian education but didn’t know where to find. Israel Galindo is Associate Dean for Lifelong Learning at Columbia Theological Seminary in Decatur, GA.